(AP) KANSAS CITY, Mo. 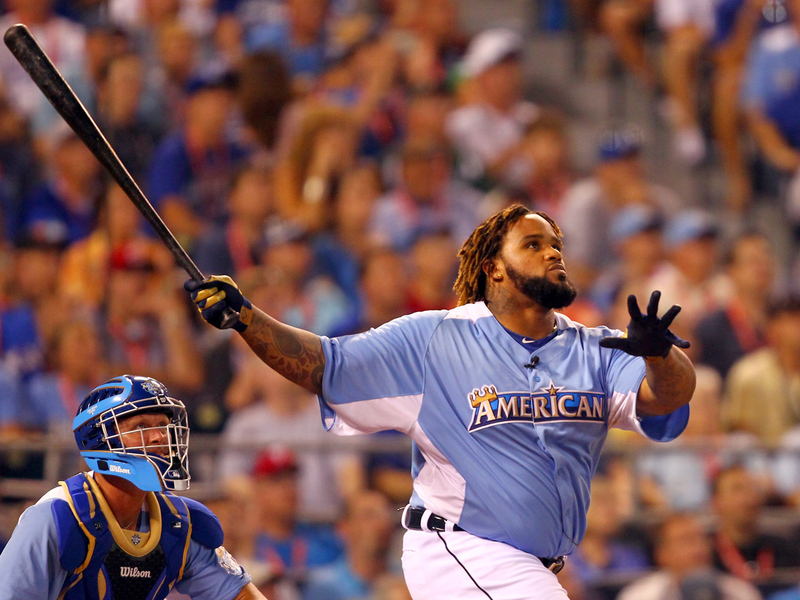 - Prince Fielder made a splash at the All-Star Home Run Derby. Eight of them. The Detroit slugger joined Ken Griffey Jr. as the only players to win multiple titles, thrilling the crowd at Kauffman Stadium with several shots into the right-field fountain and beating Toronto's Jose Bautista 12-7 in the final Monday night. "Just being mentioned with him is real special," said Fielder, who spent time at Griffey's house when he was a kid. "My dad would let me go over and play video games all day. He always took care of me when I was a kid." On a night when the Yankees' Robinson Cano was repeatedly booed and went homerless, Fielder put on the most powerful display among baseball's big boppers. Winner at St. Louis' Busch Stadium three years ago, Fielder had a total of 28 home runs over three rounds to cap the main event on the eve of the All-Star game. He hit the four longest drives of the night, including a pair at 476 feet. "They were far," he said. "That's not easy to hit it out there." While the ball stayed out of McCovey Cove during the 2007 Derby at San Francisco's AT&T Park and the right-field swimming pool last year at Chase Field in Phoenix, there was plenty of aquatic activity in Kansas City, second only to Rome for most fountains in cities around the world. After three splash shots among his five homers in the first round, Fielder started off the second round as the setting sun lit up clouds in a pretty pink behind the left-field wall. His mop of dreadlocks visible as he hit without a helmet, Fielder deposited four more balls into the 322-foot-wide water spectacular, which by then was illuminated in the twilight. He added another water drive in the final round, then leaned against one of his sons while he watched Bautista swing. "I'm a little disappointed," Bautista said. "I'm capable of doing more. I had a lot of fun doing it." When he won three years ago in St. Louis, Fielder's 23 homers included a 503-foot drive that disappeared between two sections of bleachers in right-center. Griffey won titles in 1994 at Pittsburgh's Three Rivers Stadium, 1998 at Denver's Coors Field and 1999 at Boston's Fenway Park. Cano set a final-round record of 12 en route to last year's title in Phoenix, where he hit 32 overall. This year he was the object of loud booing throughout by fans upset he didn't select the Royals' Billy Butler after promising to take a hometown player for his derby team. Fans chanted "Bil-ly Butler!" in between their boos. When it was over, Cano got hugs from Boston's David Ortiz and Yankees teammates Curtis Granderson and CC Sabathia. "I was criticized before I got here. If you play for the Yankees you get booed everywhere you go," Cano said. It was the 17th time a player went homerless in the Derby, the first since Detroit's Brandon Inge in 2009. "that was the most interesting reaction to a home rum derby i've ever seen, but the fans were excited which is all that counts," Granderson tweeted. Carlos Gonzalez and Andrew McCutchen (four each) and Matt Kemp (one) also were dropped after the first round. Carlos Beltran (12) was dropped after the second round, when Mark Trumbo and Bautista were tied with 13 apiece, leading to a swingoff won by Bautista 2-1. Trumbo and Bautista each managed to put a drive into the small fountain beyond the left-field wall. Trumbo also hit a pair of shots over the Royals Hall of Fame in left, toward Interstate 70.